Floodguards technology is the best possible investment a householder or company can make in preventing the devastating effects of a flood – but someone has to be available to put the mitigation measures in place. If you are away, the Floodalert notifies key holders of a potential flood on the way. Alternatively if the building is occupied the Floodalert issues an audible alarm warning of a potential flood. 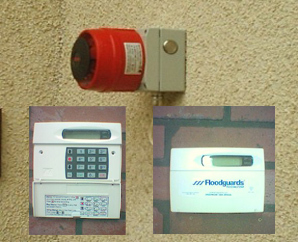 Like all good ideas, Floodalert is based on a simple concept: a burglar alarm for water. A sensor pod is put up at a point where you know flood water reaches before it threatens your property – possibly a garden wall or the side of an outbuilding. Immediately water hits the pod’s sensor, an electronic alert is sent to a control box inside your building. The control box sets off an audible alarm and starts dialling four telephone numbers in turn with a recorded flood warning message – and keeps dialling until it gets a positive response that help is on the way. Your designated numbers can be for anyone, from a next-door neighbour to a registered keyholder or security company. Thus, giving the nominated people, a warning that their mitigation measures need to be put in place.